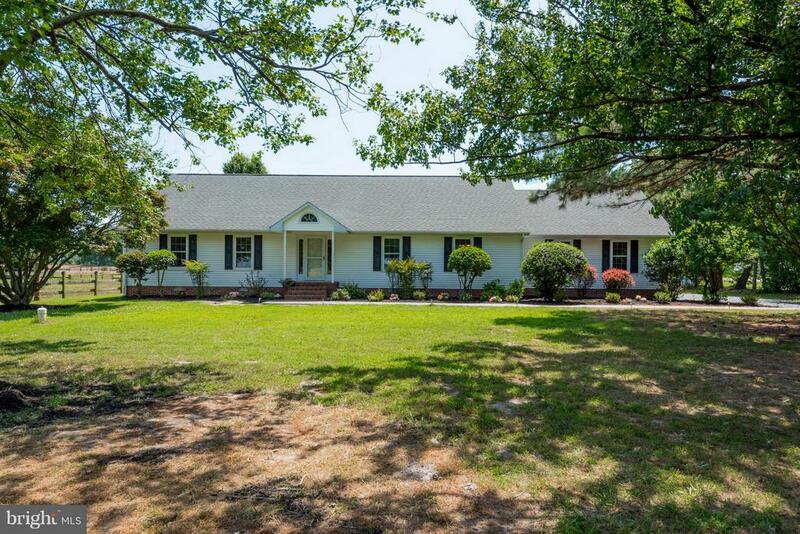 All Melfa homes currently listed for sale in Melfa as of 04/25/2019 are shown below. You can change the search criteria at any time by pressing the 'Change Search' button below. If you have any questions or you would like more information about any Melfa homes for sale or other Melfa real estate, please contact us and one of our knowledgeable Melfa REALTORS® would be pleased to assist you. "~WELCOME HOME to this wonderful 12 acre farm with a custom built 3400 + sq. ft. ranch style home. Enjoy one level living with a complete guest suite upstairs with two huge flex space rooms. Hardwood floors in main living areas, new carpet in the bedrooms. Easy cleaning with the central vacuum, Large high efficiency windows to enjoy the views. A beautiful vaulted ceiling graces the Sun Room. Relax on the bi-level deck with amazing views of the paddocks and sunsets. The home is on 1.5 acres, the fields have about 8 acres fenced into separate fields, including a show or practice ring. There are additional acres that boast a pond and wooded land. The main barn is a center court, open air, 6 stall barn with electric and well water (10 gpm) , there is a separate room for feed and tack. There is also a shade canopy on the field side of the barn. The pole barn has an isolation stall, and space for storage, feed, or tack, and next to the pole barn is a storage building/chicken coop with a fenced yard. Bring your horses, chickens, and other farm animals, you can also board horses on this 12 acre agriculturally zoned land. Centrally located on Virginia's Eastern Shore, Melfa is just minutes from the Atlantic Ocean and the Chesapeake Bay. Enjoy all the wonderful attractions of the Eastern Shore, boating, fishing, hunting, biking, camping, flying, shopping , dining and entertainment, The Eastern Shore Country Club, and there is a new hospital nearby. This can be a primary home or vacation home, you decide, either way, it can be your next HOME!"